Within a few months, the young designer created a collection of prototypes for Sight Unseen Offsite in 2016. 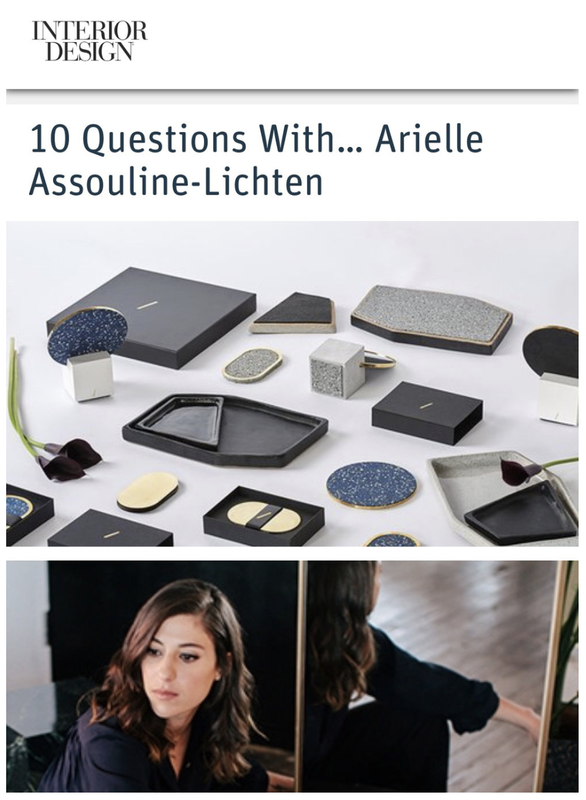 “I made everything from tassels to a table in rubber,” explains Assouline-Litchen, who imports the unassuming material from Pennsylvania and has a die-cutter in Williamsburg manufacture her small batch of products. “I didn’t expect for it to be such a hit.” That same year, the alum of ace architecture firms, such as Kengo Kuma and BIG, secured herself a spot on the American Design Hot List, and soon after, she added a product extension, called Slash Objects, to her multidisciplinary firm Slash Projects. Now, with a collection of tactile furnishings and decor that elevate rubber’s simplicity with sumptuous material pairings — including speckled coasters with brass details and a sculptural standing mirror that erects from a marble base — Assouline-Litchen’s studio is buzzing with artistic energy. “It was really about stripping the rubber of its context and re-situating it among these high-end materials. The combination gives a traditional product new life,” she says, pointing to a sea of rubber CYL stools with brass inlays.